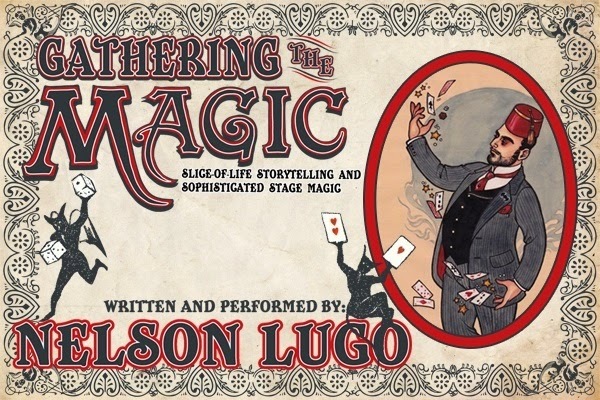 StageBuzz.com: Interview with Nelson Lugo of "Gathering the Magic"
Interview with Nelson Lugo of "Gathering the Magic"
Last fall I interviewed magician Nelson Lugo about a new show he was working on, "Gathering the Magic." Since then, the show has been given an extended run at The Tank (opening tonight) and a number of other good things have been happening for him. I caught up with him this week to talk about his plans for 2015. First of all, congratulations on bringing "Gathering the Magic" back for an extended run at The Tank. It seems like you've been pretty busy since we last spoke in September, including a new residency at The Tank. How is that going? Well, the simple answer is, "so far, so good". The not-so-simple answer is, "I've learned that when given the opportunity to create anything, I am paralyzed into doing nothing". The real answer is more likely somewhere in the middle. I've written two of the stories so far and I found a composer to create the musical underscoring for the show. Basically, I'm gathering what will be the foundations for the most ambitious project I've ever undertaken. So, you know, no pressure. Other than the residency and the show, what else do you have coming up in 2015? For the past couple of years, I’ve been slowly working on a children’s book and a beginner’s magic book. I’m not sure if I’ll be able to make any headway with those two projects but they are definitely on the pile of things to-do. I’m also thinking of starting my own Comic Book review blog. So basically, I whole lot of writing projects in my near future. Has "Gathering the Magic" changed much since the production in the fall? Yes, a little. It has certainly tightened up as a show. It went from being a 90 minute show to a 75 minute show. I am far more comfortable with the magic and the text than I ever have been. There is one small addition to the show that was not in the previous run that I think is hysterically funny. I certainly hope that the audiences think it’s funny too. I don’t want to give it away but it really brings home my unique relationship to Batman. What is your favorite magic trick from the show? They are all my favorite! I love performing each one. The one act that has garnered the most feedback though is my one and only trick with cards where I use Magic The Gathering™ cards instead of standard playing cards. The trick its self is very old and is often considered to be either passé or cliché within the magic community, but the praise I’ve been getting from professional magicians is that my presentation is both completely original and very clever. Knowing that gives me a great sense of accomplishment and makes me smile whenever I perform it. Tell me about the opening acts for your show. It looks like you have some great musical talent lined up. Absolutely! I am so damn lucky to have so many wonderfully talented friends. I’ve got the ridiculously funny Killy Mockstar Dwyer, the lovely Charles Stunning who is one half of the comedy band Afterbirth Monkey, the insane Schaffer the Darklord whose raps and rhymes are the funny/angry anthems of my life, Matt Dallow is a member of The Sunnyside Social Club and one hell of an artist, and rounding out the list is Eli August & The Abandoned Buildings – they are a chamber folk/rock/steampunk band based out of Baltimore. How did you line up these acts? Are these folks you've worked with before? Oddly enough, it wasn’t that hard. I am blessed to know so many crazy talented people. I just put the call out for opening acts and they all answered the call. In fact, the hardest part was having to turn away people who wanted to share the stage with me. The group I have now are people I love and trust, as well as people whom I have always wanted to walk the boards with. It’s a great feeling to know that the artists that I admire and listen to will be supporting me in my crazy idea for a stage show. The funny thing is… I think the roles are reversed here. If anything I should be opening for them and I would count myself lucky to do so. If NPR’s This American Life were to put on a magic show, “Gathering The Magic” would be the result. "Gathering the Magic" runs January 30th through February 5th at The Tank (151 W. 46th Street, 8th Floor). Want to see Nelson in action? Check out the promotional video for the show.